Perhaps we know Patrick Nilsson’s artistic practise mostly through his clever yet blunt drawings. His sculptural works are sometimes recognized through his “bbq-skewer-layering-technique”. Nilsson stacks items and layers of meaning onto each other and put them into dialogue, which in turn creates the dynamics of his sculptures. In a very colourful way Nilsson describes his process “Well, it’s just like a constant itching that you just have to cope with”. It’s an itching we are happy that he is suffering from. 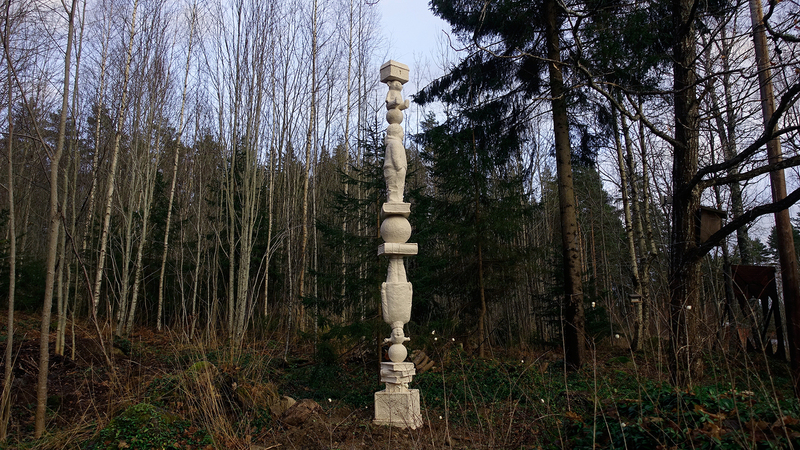 The sculpture Landmark is erected like a milky-white totem in the woods. The sculpture (the white balls, the white secret boxes, the white young school kids and the white books) all together creates a ghost-like addition to Persbo Sculpture Park. Patrick Nilsson received his master degree in Fine Arts from the Royal Art Academy in Stockholm in 1997. He is frequently shown at institutions and galleries in Sweden as well as internationally. He has been at the prestigious 1 year New York residence; govern by the Swedish Arts Committee. In 2013 Nilsson received the Stena Prize in Gothenburg. A number of public works has been produced by Nilsson over the years, e.g. at Gävle Public Hospital and the preschool Kolonetten in Stockholm.